One last reminder: Deadline approaching soon! Before books, before blogs and before mass media, there were broadsides. Historically, broadsheet posters were ephemeral in nature: often political or editorial proclamations or even advertising. Today, broadsides hang at the intersection of art and literature. 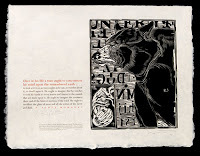 Letterpress printed broadsides are valued as graphic fine art designed and printed by a true craftsperson; but also as fine literature featuring poetry or prose. Complete entry information and online entry form can be found here. Entry deadline is September 1, 2009. My faith in mankind is repaired–not quite restored, but improved. The stolen book arrived in today’s mail in an unmarked box with a very nice typewritten letter. Thank you. Well, I guess we’ve been lucky here at 23 Sandy. In the 2 1/2 years we’ve been open, we’ve never had a piece of art stolen from the gallery. I’m sad to report that it happened yesterday at Portland’s Letterpress Printers Fair at Liberty Hall. Fantastic event, nonetheless! Thank you to Carye and her team of organizers and to everyone who bought artist books and broadsides from the gallery. A good time was had by all, including the over 300 visitors! I thought I’d post a few details about the stolen book. If you happen to see it somewhere call me. I’ve put a hex on whomever would dare steal from an artist. The book is by one of our most popular gallery artists, Linda Welch. 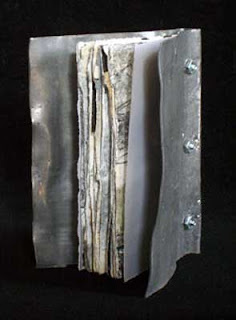 It has a chunky sheet of soft, bendable, corrugated lead for the cover, 16 pages of gorgeous mixed media collage inside and is bound with three screws and nuts on the spine. The title of the book is Beauty’s Shadow and it measures 4.25″ x 3″ x .5″. Thanks again to everyone who came to the fair. It truly was a wonderful event, even with one sad note. 23 Sandy is Closed for Summer Break! We will re-open on First Friday, September 4th with a very exciting installation by Tacoma sculptor Holly A. Senn. Stay tuned for more details on all the great plans we have for this fall. In the meantime, blog posts, Twitter posts and Facebook posts will all be more sporadic. Have a great month! Above Photo: Bur © Holly A. Senn. Photo by Duncan Price.